Are you looking for a solution to replace your boring, ugly optin forms without having to hire a designer or developer? In this case study, we’ll discover how LeadFuze used OptinMonster’s predesigned templates to increase conversions 4X! 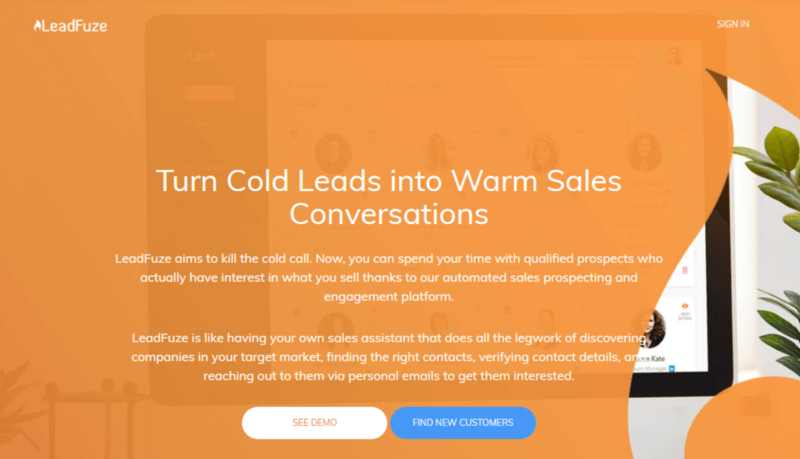 LeadFuze is an automated sales prospecting and engagement platform that aims to kill the cold call. They had very simple goal for using OptinMonster. They just wanted a more elegant way to collect leads for their email list. As they began using OptinMonster, however, they discovered that our campaigns are both well designed, and extremely effective. LeadFuze started by replacing their boring after-post optin with one of OptinMonster’s predesigned inline optins. Inline optins can be placed anywhere within the content of a page or post, including before or after the content. This optin offers the lead magnet, “10 Point Cold Email Checklist.” A lead magnet is any piece of valuable information offered in exchange for an email address. The goal of a lead magnet is to add more people to the wide end of your sales funnel. With more leads, you increase the potential for more sales. LeadFuze also added the same offer higher up on the page, within the article itself. They did this by duplicating the original inline optin, and renaming it to reflect its placement on the page. The new optin has its own unique ID. Rather than embedding the same exact optin multiple times, duplicating the optin lets LeadFuze measure the performance of the placement of the optin, as well as the offer itself. The placement of a campaign can dramatically affect its conversion rates. In fact, the optin at the end of the article converted 5 times more than the optin placed higher on the page. The two optins together convert around .7% of visitors to the pages where they are placed, adding hundreds of visitors to the LeadFuze email list each year. When the same strategy is implemented across several blog posts or categories on a site, the overall impact on a list size can be substantial. In fact, LeadFuze said this method converts 4 times as many visitors as their previous optin did. LeadFuze is not the only OptinMonster customer to discover the power of repeating an offer multiple times in one article. Lilach Bullock did the same thing, repeating her offer four to five times per page. This method earned her a 58% increase in conversions. 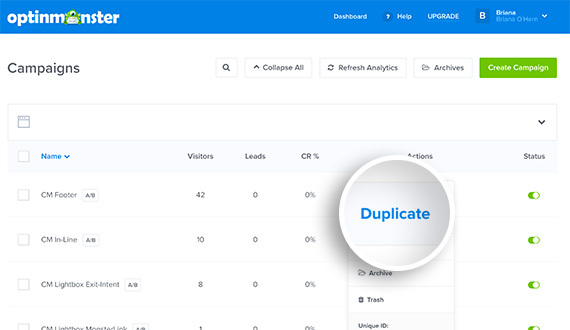 After seeing how easily the inline optins added visitors to the top of their sales funnel, LeadFuze focused their attention on prospects in the middle of the funnel. The middle of a sales funnel is the point when the customer is clearly asked to make a purchase. LeadFuze does this using webinars. Visitors are invited to the webinar using an OptinMonster exit-intent optin. Exit-intent optins trigger only when a visitor’s mouse motions towards the browser, indicating they’re about to leave the website. The optin utilizes our Yes/No feature to replace the traditional optin form with one or two buttons. The buttons can redirect visitors to another URL, like a webinar registration page. They can also be used to reveal an optin form, or to simply close the optin altogether. This exit-intent optin converts an average of 1.85% of site visitors. On some pages of the site, it’s as high as 24.55%! LeadFuze is steadily building a quality list using OptinMonster. 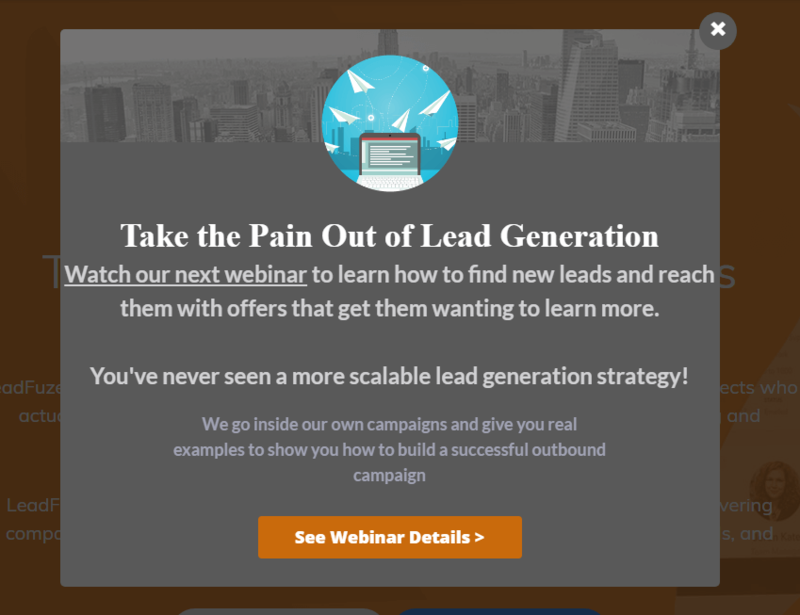 LeadFuze converted 1.85% of abandoning visitors into webinar attendees. LeadFuze captured .7% of visitors’ email addresses with inline optins. LeadFuze increased conversions 4X using OptinMonster. Visitors may not be ready to make a decision about your offer the first time they view it. Repeat your offer several times throughout a single article. Consider making the same offer with different types of optins, or with different triggers. The same offer presented in a different way or at a different time might just be what converts best. OptinMonster is our ONLY promotion strategy we’re using right now for our webinar and it’s driving quality leads for us every single day!